Down from £159 to £139 now. Make sure every important detail of your car journeys is recorded in super-smooth Full HD at 60 fps - whether it's beautiful scenery, famous landmarks or traffic incidents. For every second you will get 60 frames of video, compared to the standard 30. It's as useful for reliving great moments as it is for capturing accidents to help insurance claims. 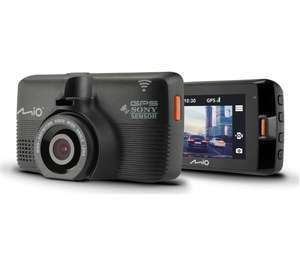 The MIO MiVue 792 WiFi Pro Dash Cam records bright, clear footage with its f/1.8 aperture – avoid blind spots thanks to a wide 140%u25E6 degree viewing angle. A high-res STARVIS CMOS sensor, from Sony, ensures deep contrast and colours that pop with detail, even when you're driving in low light, or during the night. Sometimes you need to report or share an incident in the moment, whether it's to support claims or ensure that a true version of events is communicated. The MiVue 792 WiFi Pro has integrated WiFi so you can immediately send videos to your smartphone, or share online using the MiVue app. Keep track of important route details with integrated GPS - including speed, altitude, longitude, latitude and heading. They're ideal for remembering where you saw something or for use in a formal road incident case. Your MiVue 792 WiFi Pro Dash Cam features built-in safety camera warnings, so you know where to check your speed. Camera data is updated monthly for the lifetime of your device, free of charge. Stay safe with the Advanced Driver Assistance Systems (ADAS). It features a Forward Collision Warning System (FCWS) and Lane Departure Warning System (LDWS), warning you of decreasing following distances or if your car moves out of lane. Compatible with the MiVue A20 rear camera to add all-around safety. recording the view from your rear windscreen. Sounds like poor mans Tesla.